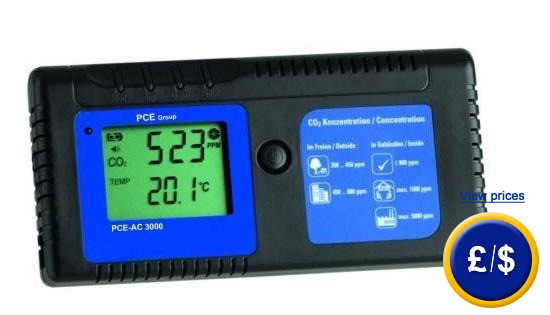 The PCE-AC 3000 air quality meter is an exceptional device that measures and checks air quality, and the content of carbon dioxide in houses, companies, public buildings and other public places. The air quality meter comes with an adjustable alarm with acoustic and visual signal, maximum and minimum values and value register for 24 hours. A high concentration of carbon dioxide can appear inside a building with bad air ventilation. Due to its integrated RJ-45, the air quality meter can also control a ventilation appliance. Carbon dioxide reduces well-being (causing fatigue, headache, etc. ) and it therefore also reduces the individual performance. A person's well-being is reduced by a concentration of more than 800 ppm. At the following link there is an overview where you can find the gas meter which suits your needs. Laboratory calibration to meet the ISO standard (when the meter is ordered or as a recalibration). In The name and details of the customer as well as the serial number are included in the document.